1Public Hospital Waiern, Feldkirchen, Austria; 2Department of Psychology, Alps-Adria University, Klagenfurt, Austria. Increasing life expectancy correlating highly with polymorbidity, frequently causes recurring inpatient stays at Geriatric hospital wards. After discharge from hospital, an offer for physical and psychological after-care seems necessary for most patients. Purpose of this project was the development, implementation and primary assessment of an out-patient after-care intervention program for elderly, multimorbid patients and their relatives. During a period of eight months an interdisciplinary team offered psychological interventions as well as medical advice, nursing care and social casework. Primary goal was the investigation of health care utilization conduct and effectiveness of this after-care service in regard to sustainable stabilization of former inpatients. Preliminary results show higher demand of psychological and psychotherapeutic groups, whereas medical questions and nursing care problems were of minor concern to the patients. Contrary to our presumptions, even geriatric patients with a diagnosis of depression or anxiety disorder, showed to be reliable and constructive participants in psychological group settings. Situation and problems of (nursing) relatives could be identified accurately, although they represented an independent target group, possibly in need of more specific interventions. Due to increasing life expectancy with higher risks of multimorbidity and dementia, patient centered care has become increasingly challenging. During the last decades research in Gerontology has focused mainly on a positive perspective on ageing. Recommended models of care and treatment for the elderly, seek to preserve or even enhance quality of life by activating available resources [1-3]. Aging process nevertheless may lead to recurrent inpatient stays of older patients at Geriatric hospital wards. Repeated assignments to the hospital by general practitioners as well as recurrent selfhospitalization point towards supply shortage of psychosocial services. Practice based institutions as well as outpatient therapy offers fall short of sufficient facilities providing post treatment. After discharge from the hospital, outpatient care is of great importance in order to sustain the stabilization reached during the stay. Additional emphasis on nursing relatives seems equally important . Different after-care concepts, such as daytime clinics or outpatient therapy centers provide supporting structures for geriatric patients, although they mainly exist in urban environments and entail rather high costs. Ambulant care by interdisciplinary teams is another popular and frequent procedure, offered to predominantly multimorbid patients with considerable physical disabilities. These offers are likewise costly and cause significant organizational efforts . Geriatric outpatient care delivered within the logistic structure of the hospital (involving medical and therapeutical treatments) is a rather innovative and sparsely researched method , combining cost efficiency with high acceptance by the elderly. The areal, temporal and individual-related close link to the inpatient stay can help avoid time-consuming handovers or repeated admissions to subsequent social support services. This continuity in therapy may encourage compliance and reduce anxiety . Group interventions aim at behaviour modification and the recovery and preservation of autonomy. The main priority however is a more positive mental state. 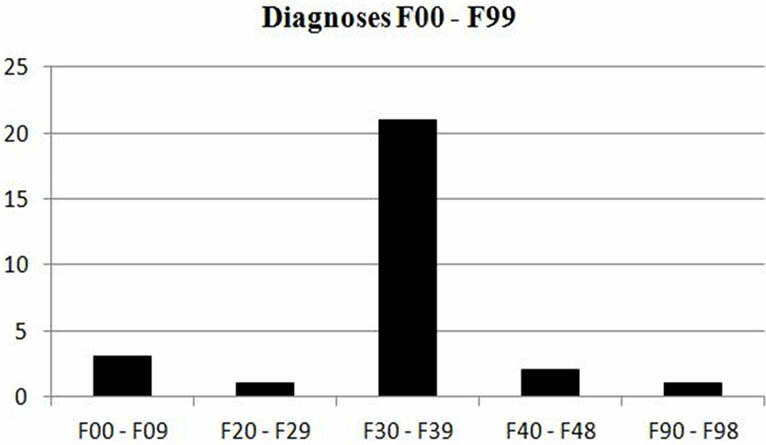 Results of a benchmarking survey in a number of geriatric wards in Austria showed that nearly 29% of multimorbid geriatric patients were diagnosed with depression . Depressive symptoms were highly associated with lack of social contacts—especially in elderly women who constituted 85% of the examined (polled) patients . These findings justify the choice of group interventions for those patients. Essential for successful rehabilitation is the basic assessment of the patient’s current condition within the five domains, such as mobility, cognition, self-efficiency, social contacts and emotional state as well as interdisciplinary teamwork in therapeutic-rehabilitative interventions . The staff appointment scheme for clinical psychologists at geriatric wards in Austria considers a single position per 100 patients. Out-patient after-care settings are even more under-staffed. This offer for aftercare can be described as process of exploration, decision-making and problem-solving regarding age-specific problems. This pilot study included a practical step by step approach, resulting in a comprehensible and transparent list of possible interventions. In addition to imparting general psychological information, topics were meant to cover the relevant troubles of patients. Individual social skills and the ongoing group process have to be considered. The aftercare is divided in theme-oriented steps of intervention, comparable to a modular construction system. 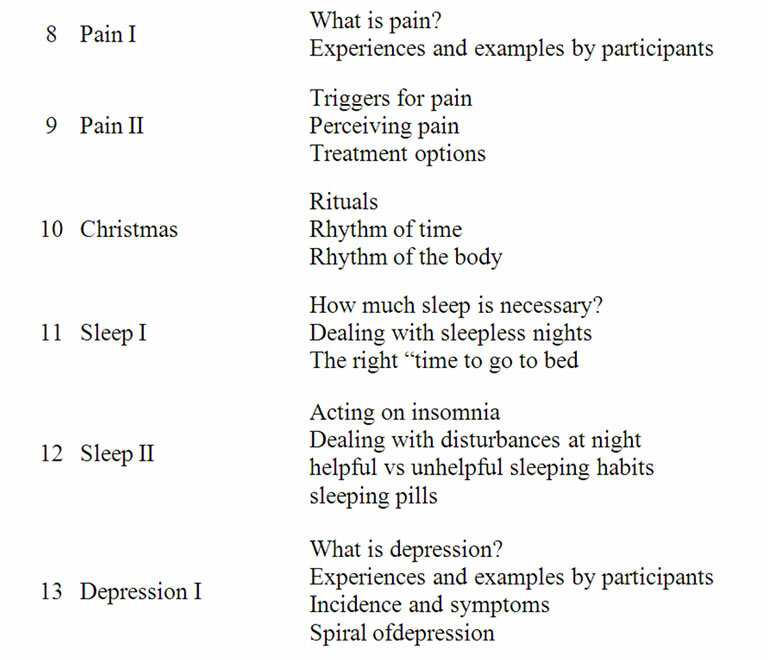 These individual subject areas are selected following motivation, problem awareness and attentiveness of patients. Depending on the respective requirements of the group, some topics may be more popular than others. The different topics are presented in various settings: 1) group intervention, includes conveying important information to all participants, problem-solving within the group and mutual development of coping-strategies; 2) personal consultation, e.g., emphasis on specific personally relevant topics, individual problem solving and development of coping-strategies as well as motivation; and 3) homework, for example preparation and reinforcement of specific topics and trying out, practicing and strengthening new strategies and skills. During in-patient stay at the geriatric ward at the hospital in Waiern, the interdisciplinary team presented the aftercare project to the patients and their relatives. Criteria for inclusion were: 1) age over 60 years; 2) place of residence in the vicinity of the hospital (time of travel not more than 30 minutes); 3) assessment of dementia (MMSE-score > 21) ; and 4) willingness to participate. For relatives no criteria were defined, anybody interested was provided with information folders. All prospective participants signed informed consent forms after having been assured of anonymity and protection of privacy. After informing patients and relatives in person as well as by written information, the intervention started with a first meeting of the group. Patients attending the group had been dismissed from hospital in the week preceding the intervention. 1) After a general address of welcome and some loosening exercises, the participants were asked to present possible requirements and questions. Subsequently the group session took place. 2) The chosen topics (see Table 1) were dealt with by the group according to logic chronology. 3) In addition to psychological interventions, medical or social services as well as individual consultation were offered after the group sessions. 4) After the individual supplementary interventions (medical treatments, consultancy by social services, personal counseling) the group got together again for cake and coffee. 5) At the end of the afternoon, the next meeting was planned (time, location, relevant topics, question etc.). 1) Which of the offered interventions will be accepted by the patients and their relatives (utilization behavior)? 2) To what extent can the outpatient aftercare treatment contribute to the stabilization of the former patients? 3) Are (caring) relatives a separate target group for specific interventions? Table 1. Overview of themes. basic geriatric assessment (e.g. MMSE, GDS ), to do a preand post comparison. 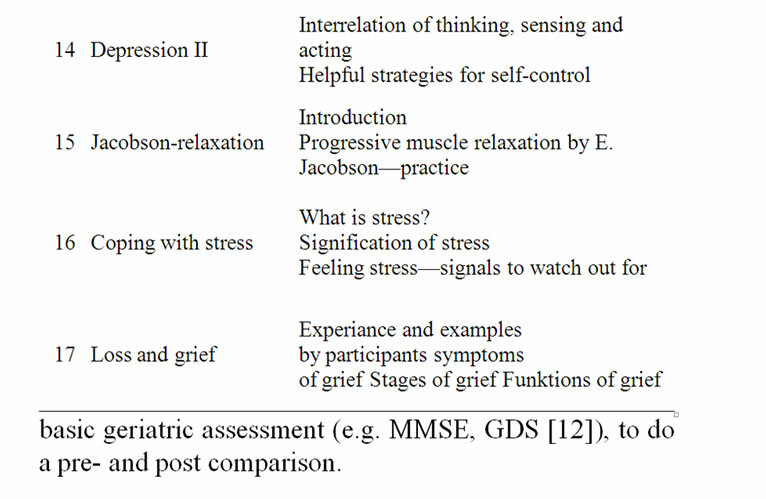 The aim of this study was to find appropriate group-topics for former geriatric patients and their families. Another aim was to evaluate the effectiveness of the interventions. The data were collected according to standard inferential parametric and nonparametric methods by using SPSS 20.0  and according to the guidelines of qualitative content analysis . As the aftercare group was a novelty, a mainly descriptive approach had been chosen. Between September 2010 and June 2011, 26 people took part in the aftercare treatment. The study participants were predominantly female (85%). The average age was 77 (±10) years. One third of the participants were married, two third were widowed. Almost half of the persons lived with their partner or family, 33% persons lived alone und 22% in an institutional setting (see Figure 1). 24 persons had children (range: 1 - 11). All persons included in the study were estimated as multimorbid. The vast majority were suffering from heart and circulatory diseases, followed by mental disorders, manifested in depression as the most common form. The following chart (see Figure 2) illustrates that after initial teething problems, the group size was fairly constant. In most meetings, the number of participants commuted between six to eight people. In exceptional cases 11, 13 or 15 people attended. Prospectively it will be important to set up an upper limit regarding the group size. Figure 1. Mental and behavioral disorders. interest in the group process. Participants did neither express particular sympathy or aversion for other group members. No one was excluded by the group nor did anyone leave by heror himself. The implementation of group observations requires intensive training beforehand and a high level of concentration during the procedure. Monitoring of the progress of a group setting includes targeted observations of the behavior of individual participants and recording of individual verbal and nonverbal messages. In the present study, these claims could not be fully met, because of staff turnovers. 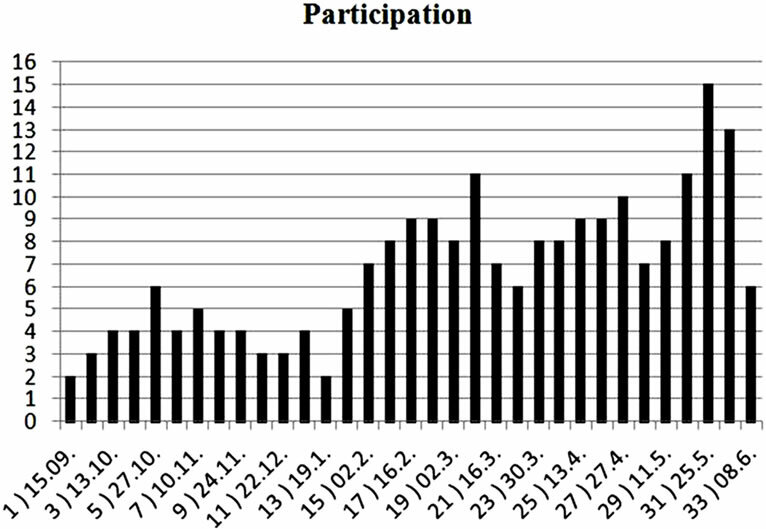 Another aspect of the utilization behavior could be derived from the implementation of specific interventions: Over the entire period, 30 individual psychological interviews with patients and two interviews with relatives were performed. In addition, three medical appointments, light therapy (15 units) and relaxation training (2 units) took place. Based on these results we must realize that family members cannot be considered as a specific and separate target group. Main focus is the psychological need for individual, supportive conversation. Content analyses show that individual interventions basically dealt with the following topics: lack of energy (4x), death and mourning (3x), high performance requi— rements (3x), familial difficulties (3x), loneliness (3x), pain (2x), trauma (2x), anxiety (2x) and segregation (2). The central question how much an aftercare treatment can contribute to a general stabilization to former inpatients is answered in the following summative evaluation. Prior to the beginning we discussed the individual expectations of each participant (problems, desires, goals) towards the group. The individually formulated goals were evaluated after attending the aftercare treatment. 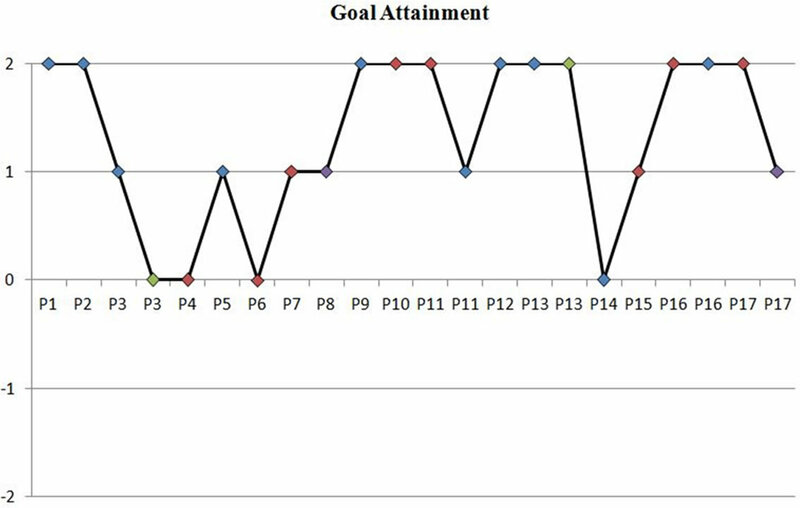 Figure 3 shows the pre-post comparison of individual goal attainment on a scale from –2 to +2. Generally positive change could be observed. None of the seventeen participants with complete data sets, showed deterioration compared to the initial level. The experiences gained at the hospital of Waiern in Carinthia/Austria led to the conclusion that the installment of psychologically oriented after-care groups for geriatric patients may meet with considerable start-up problems. Note: The colors in the figure represent: community (blue), information (green), wellness (red) and social competence or activity (purple). Figure 3. Achievement of the group members. At presentation of the project, patients as well as their relatives reacted seemingly enthusiastic although subsequent factual utilization was rather slow. Transport problems or trouble with the time of the appointment were reported, which led to recurrent failures to recruit patients for the group. In the weeks preceding the beginning of the project, the group therefore mostly consisted of only one or two participants. After the first positive experiences made by the patients, participation could be raised. The information policy was optimized by including the different occupational groups at the geriatric ward as well as handing out information folders. The acceptance by the interdisciplinary team at the hospital also had to be encouraged. Doctors and nurses for example and other occupational groups who had not been involved intensively in the development of the project, were convinced by the positive feedback of patients, which in turn, led to positive contributions on their part. Within the investigated utilization behavior for the offered aftercare program, the highest demand was found for psychological/psychotherapeutical interventions while medical or nursing interventions were little sought after. Out of the offered psychological interventions, the groups were the most favoured ones, although personal counseling, especially after a crisis or personal sorrow took place occasionally. This combination of group therapy and personal counseling showed to be most efficient and supporting. The fact that only few requests were made regarding medical or nursing problems can be explained by the satisfactory coverage of services by general practitioners and home-visiting caregivers. Here one must note that every patient discharged from hospital is reassigned to her or his family doctor by medical report. Already during the in-patient stay, possible nursing requirements and demand for social services are questioned and organized if necessary. On the other hand, the astonishingly high acceptance and constant group attendance suggests a significant lack of offers in psychological/psychtherapuetical post-stationary and after-care settings, especially for this age-group. Towards the end of the project the group had grown to an average size often or even more patients. In order to upkeep the high level of quality, it will become necessary in the future to divide the group. The first group would cater for the patients right after dismissal, working on the themes mentioned above (up to 3 month after in-patient stay) and a second follow-up group for those, who wish to continue attending the group for a longer period (3 to 12 months). The summative evaluation of the individually aspired goals showed a most favourable outcome. None of the participants had an inferior result, compared to the beginning, which is noticeable especially in light of the multimorbidity and the average age of 77 years of the patients and the length of the observation period of four to five months. It stands to reason, that agreeing on such individual goals may constitute an important reference point for the group design. In contrast to the substantial amount of work liaison and support of relatives often constitutes during in-patient stay of older persons, very few requests came from relatives during the after-care program. Contact to the relatives soon decreased—which indicates a high level of selfcompetency of the patients after a short time, on the other hand, this target group must probably be approached in a different way. Generally nursing relatives show a low health care utilization [4,15]. Transportation of the multimorbid patients to the aftercare group was organized with public or private means of transport, such as being driven by relatives or being picked up by taxi services. This was in contrast to the customarily used transport by ambulance of geriatric patients, a prevalent procedure in Austria and as such very familiar to the community members. According to the opinion of the project team the competence and responsibility for getting to the hospital, was to remain with the patients and their relatives, since ambulance transport is very expensive for the community and often makes the patients feel in worse shape, than they actually are. It was most impressive to see elderly ladies living in sheltered flats or nursing homes share a taxi to get to their “weekly aftercare group, especially since those same persons had earlier been driven to examinations or consultations by ambulance. Quite some participants got to be quite friendly and started visiting each other socially. Due to these first positive findings, the Public Hospital Waiern plans to continue the aftercare program on a regular basis. 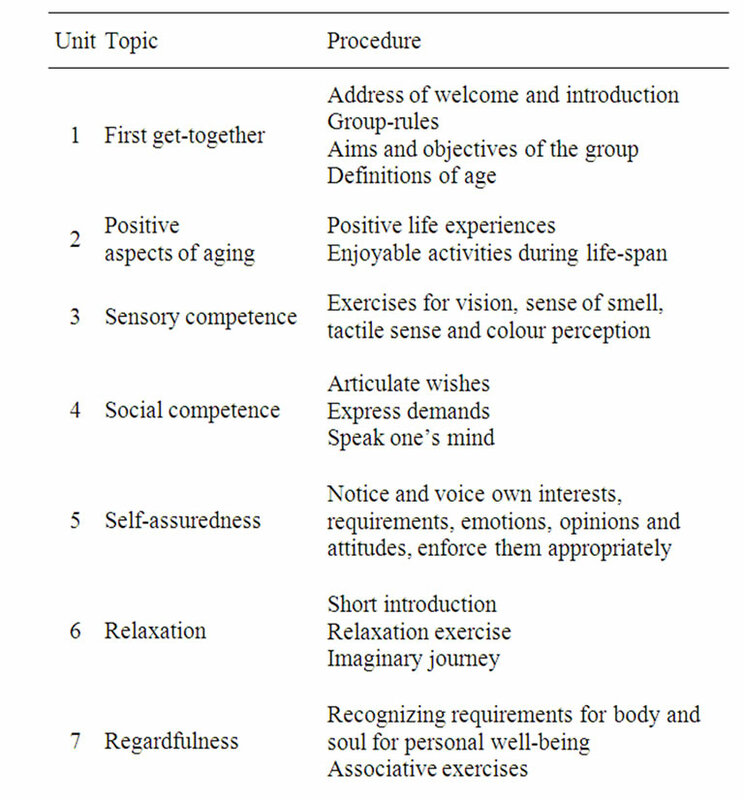 U. Lehr, “Psychology of Ageing,” Quelle & Meyer, Wiebelheim, 2007. B. Jenull, “Area of Conflict—Nursing Home,” Pabst, Lengerich, 2011. N. Gödecker-Geenen and H. Hegeler, “Social Work with the Elderly in Rehabilitation,” In: K. Aner and U. Karl, Eds., Handbuch Soziale Arbeit und Alter, Verlag für Sozialwissenschaften, Wiesbaden, 2010, pp. 129-137. W. Renner, I. Salem and H. Scholz, “After-Care for Psychiatric and Psychosomatic Patients—A Pilot-Study on a Cooperation Project between a Hospital and the University,” Praxis Klinische Verhaltensmedizin und Rehabilitation, Vol. 84, 2009, pp. 106-110. V. Zietemann, P. Machens, A. Mielck and A. Kwetkat, “Social Contacts and Depression in Geriatric Patients,” Georg Thieme Verlag, Stuttgart, 2007. C. Zippel and S. Kraus, Eds., “Social Work for the Elderly,” Mabuse, Frankfurt, 2009. M. Folstein, S. Folsteinand P. McHugh, “Mini Mental State: A Practical Method for Grading the Cognitive State of Patients for the Clinician,” Journal ofPsychiatric Research, Vol. 12, No. 3, 1975, pp. 189-198. A. Bühl, “Introduction to Modern Data Analysis,” 20th Edition, Pearson, München, 2011. P. Mayring, “Qualitative Content Analysis: Basics and Techniques,” 10th Edition, Beltz, Weinheim, 2008.